Boxcutters, Jigger, Mixing-glass, Skewers, Citrus Juicer, Strainer, Stirrer (long Spoon), Hurricane Glass. Mixed into mixing-Glass with ice, all the ingredients, except the Grenadine, the Cherries and Pineapple. 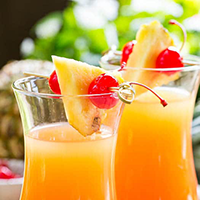 Strain into a Hurricane glass, with ice to taste, add the grenadine, letting it settle on the bottom, a skewer made with Pineapple and Cherries. Serve.